Thanks for the detailed rundown of this emitter. I got a itch to have a light with each worthy emitter, and I think this would be a good one. I’m actually a fairly big fan of the SST-50 for it’s efficiency. At higher amps it’s heat can be a problem but for running at low amps it does a wonderful job. One of the lights I use most often is a cheap sharp eagle zoomie with a de-domed SST-50 in it. At low amps it’s still fairly bright and a good 26650 seems to go forever without needed a re-charge. I don’t have the equipment to test it but I always suspected that it must be VERY efficient at low amps. Too bad they are so pricey. But good news on these new ones. I’ll have to get my hands on a few and see what I can do with them. SST-50 is not efficient, not at all. I just received five SST-40 from this seller on Aliexpress, they turned out to be the real deal. There is of course no specific information about tint/bin but with my unscientific testing they seem on par with the one I bought from KD. There is also a bit of green in the lower modes just like the one from KD. The MCPCB’s is not very good but that didn’t come as a surprise. The price has gone up a bit I payed $1.69 a piece. Nice, I’m always a little leery of buying emitters for aliexpress, but they have done pretty well with flashlights and other things. One thing about them, if you order from them and they don’t come through, you get your money back, no problem. Nice, the AE seller is really cheap. And some nice dedoming you did there! Put my SST-40 from KD in a Convoy M1 with a MTN-17DD fet+1 driver and I Really like it. The tint almost has a purplish color to it at higher amps, but not in a bad way, very pleasing to the eye, especially for low CRI. Hey can you show us the sst40 dedome beamshot?? I don’t mind about the camera quality.. you can use postimg.org for loading. Thanks. I would, but mine is not de-domed, just installed as it came from the factory. Beam looks almost identical to a typical XM-L2 in the M1. Tempting LED in all, but would be nice to have higher brightness bins available somewhere (for EU). Still, 2000 Lumen at 20 Watts at 3.6 Volts and 5.6 Amperes is very nice. The main difference is: when properly dedomed( its not that easy though, at least those samples) The tint didnt shifed much, like only 1000k or something , thus resulting in the best cool white tint( accoarding to the BLFers), like 6000k 1D or so, paired with an the AR glass even i like it. Thanks Mitko! This is very nice to hear! How is the color rendering? Any different compared to those Crees? Nice to hear that report Mitko. I guess I could machine tube for your(mine) Mitko’s thrower and put the buck driver in. 7A for DD fet is not a lot of fun to play but it surely shows potential. Thanks for the update Mitko. Looks good. The candela numbers seem consistent with djozz’s lumen measurements relative to the XPL V6. At 7.5A the SST-40 has about 14% more output than the XPL V6 at 6A (a typical direct drive current for this emitter). I usually get around 94Kcd from a dedomed XPL V6 1A in an X6, and 108Kcd from the SST-40 is a ~14% improvement. Great new emitter. I’m still waiting on mine from KD. I am not a modder.. I like flashlights.. can this sst 40 dedome swap on the jetbeam t6??? Got my SST-40s in the mail. It may have too low a Vf for single emitter use (for my tastes). I was getting 8-8.5A with mostly charged cells (GA and 30Q at ~4.05V), measured using a 10mOhm shunt in place of the tailcap in a EE X6 with FET driver. Current seems a bit too close to the 9.6A that fried the LED in djozz’s test; too risky. 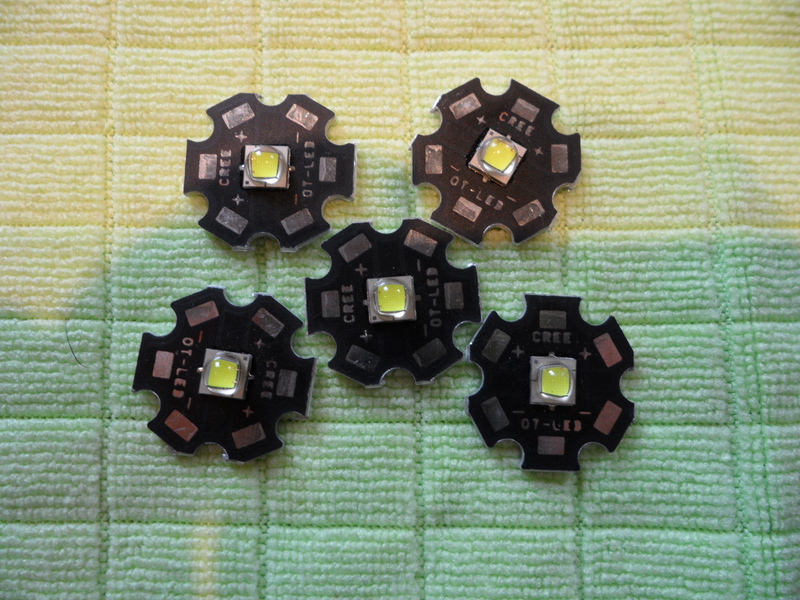 Maybe better used in multi-emitter FET driver setups where the LED’s low Vf allows them to be driven better than XPLs and have a bit of a safety margin below the ~9.6A point. Edit: I dedomed one using hot gasoline. The dome separated from the phosphor pretty cleanly in 20-30min. I made some small slits with a razor blade right at the base, as if I was starting to slice the dome off. I’ve heard of other people doing this. Not sure it had any effect, but thought I would mention just in case. The jetbeam T6 uses XPL emitters, which have a different footprint on the MCPCB than these SST-40s. If you want more throw you could dedome the XPL emitters it came with. 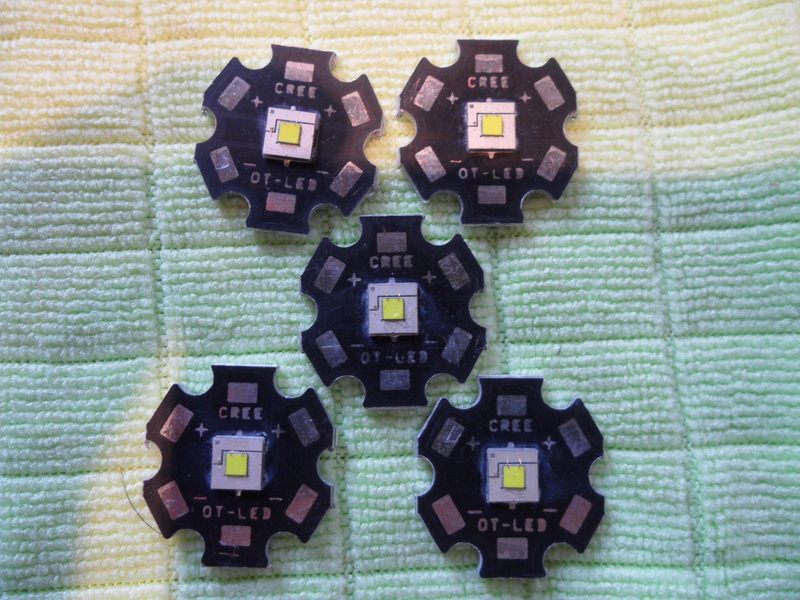 You would need to take apart the light and remove the MCPCB and learn a procedure to dedome the LEDs. High Vf emitters are not so bad as we think.If you want single 18650 performer than run time should matter to. And I hate to say but it seems that new production XP-G2(at least the one I have) gives the most optimal performance at very low current draw (XML2 or XP-L performance at only 3,6A current draw with even larger beam than good old XP-G2). 3,6A! Light never gets hot and performs superb. I should slap myself out when I was speaking against new production process XP-G2’s cause they ain’t that bad after all… At least for fed dd drivers. I received four pieces sst-40 yesterday. All four had scuffs and nicks on the domes. It’s not much but I don’t like it. So I guess I’m going going domeless. For me the optimal situation is to have the emitter(s) be driven as hard as possible without being too inefficient or risk dying from over-current. To get runtime you can always just go to a lower mode. So a single XPL V6 with FET driver is driven just about optimally at 6A, but when you put 3 or 4 in parallel from a single cell they are not driven as well. 3 or 4 SST-40 in parallel might work really well. When you compared XPG2 performance to XPL, to be clear you are talking about luminance and not total output. I got my first modded blf light from djburkes. I am very impressive with his works.. he solder joint both spring and bypass wire.. the one on the left is convoy c8 sst40 dedome.. right one is eagtac s200c2 xpg2 s4 dedome.. The tint on the sst40 dedome is very nice. No green.. it’s throw like a xpg2 dedome. Where did they come from for this to happen. Does anyone have links to a higher bin than whats at KD? I got them from here&. I don’t remember how I got the link to this store? Thought it was recommended by someone. The price is pretty cheap. Maybe they are fakes or b-grade factory rejects? I have not tryed them out yet. They look genuine but who knows. I do only single emitter 18650 fet dd builds(mostly aspherics) and XPL V6 with 6A current draw is also to much imho. New XP-G2 under precoolimator gives even larger beam than dedomed XPL with slightly better lux performance and all that at 3,6A draw which means same total output with even more intense beam to dd XPL and a lot of play on turbo and it can be safely on turbo all the time without any worry. That is important if you need longer runtime scans (driven hunting). Could use an LD-3 driver and limit high mode to 6A regulated.